Boat names are extremely personal, and the source of much discussion and divergent opinions among mariners. All you have to do is mention around a marina that you’re considering re-naming your boat and you will be bombarded with a flurry of “advice.” The suggestions range from the practical to, well, the lunatic. 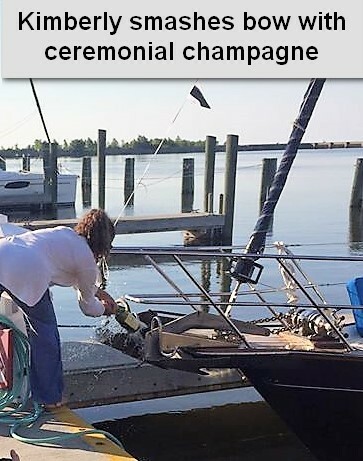 While we forego superstition, we feel that a boat’s name says a lot about her owners and their story. Among cruisers, your boat name also becomes your last name: as in Kimberly and John-Michael, [boat name]. 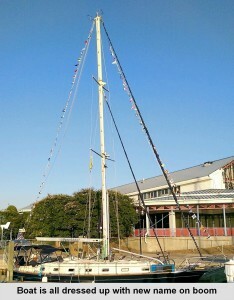 We purchased our sailboat last year with the name Whispering Sea. A beautiful name that conjures images of calm passages and restful nights in idyllic anchorages. 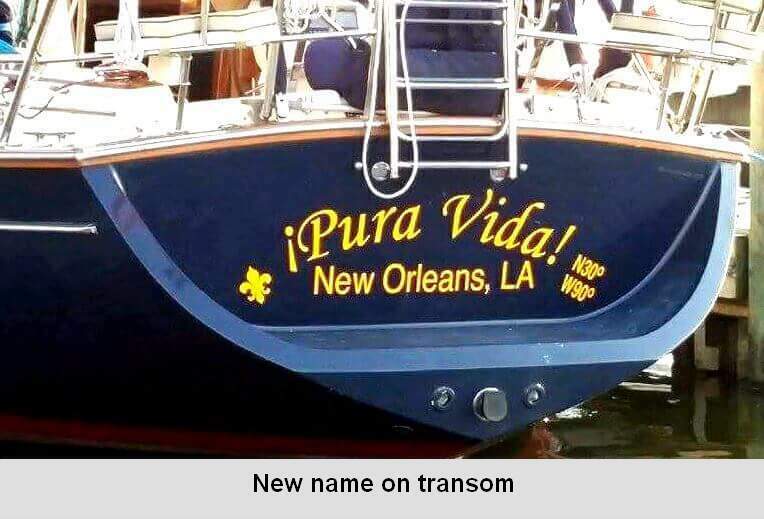 While we do hope to experience all of those things on a regular basis, we want this name to belong to the previous owners who sailed the boat for many years and took amazing care of her. By changing the name, the adventures of Whispering Sea will be theirs alone and we will start a new chapter for our adventures. That brings us to our new boat name, ¡Pura Vida! If you have ever met a Tico, a person from Costa Rica, you most certainly have heard this phrase. It literally means “pure life,” but it’s difficult to define because it is used in so many ways. See you tonight. Pura vida. How is the weather? Pura vida! This expression is quintessentially Costa Rican and it has become synonymous with the Tico way of loving life and living it to the fullest. We felt that Pura Vida was the perfect description for the journey we envision. When it came to naming our dinghy, we wanted to pay homage to our home city and Kimberly’s birthplace, New Orleans. There is a Louisiana French expression for when you get or give something extra, Lagniappe (LAN-yap). Not part of the main transaction, but something that will express generosity by the giver and make the receiver smile. Since this seems apropos for a small boat that is something extra on a live aboard sailboat, we knew we found our dinghy’s name. If you’re “out there” on the seas, keep an eye out for ¡Pura Vida! with a little Lagniappe. Kimberly & John-Michael, I’m so sorry I missed seeing yall off! And we’re going to be in NO THIS weekend….I was in NY & couldn’t change plans….please, please, please be careful & have the time of your lives!! John-Michael, she is truly “precious” cargo….love you guys & if you ever need to spend some land time, you’re always welcome on the mountain! Blessings for smooth sailing and making more wonderful memories on this journey called life. Look forward to hearing about all the adventures that lie ahead. Bon Voyage! 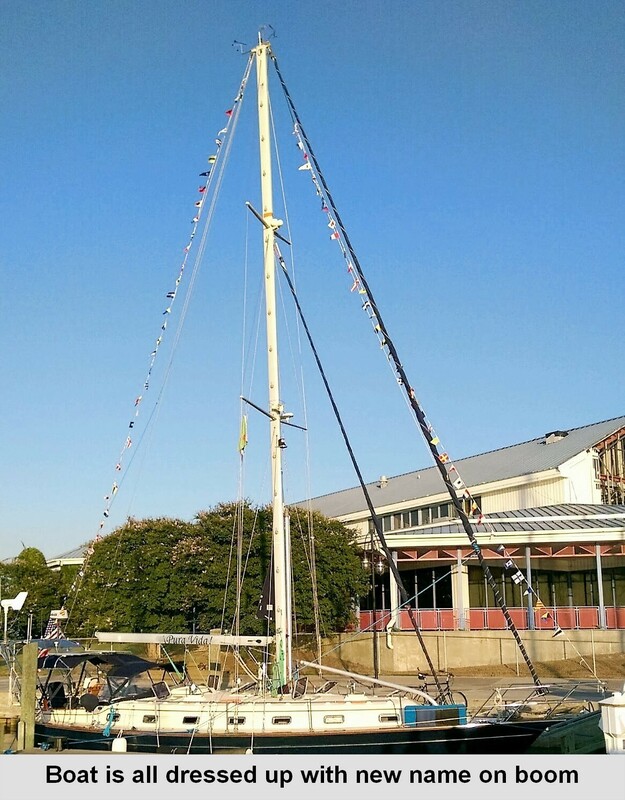 When we bought our Marine Trader Trawler it was named October Moon. I changed the name to OVER ICE. Now that I know the background story, OVER ICE has to be one of the best boat names I have heard.